Team Raptivity extends warm thanks to all the participants of the complimentary webinar “Raptivity launches Games and Simulations - Now in HTML5” held on Wednesday, 12th September, 2012. It was conducted in US friendly time zone catering to eLearning enthusiasts. The interactive session was all about mobile learning and specifically the games and simulations interactivities released in HTML5 format. The webinar started off with a poll and the results were an eye opener. The figure 1 listed below is a snapshot of the poll question asked during the webinar. Figure 1. Poll Question Many fundamental topics related to mobile learning were discussed such as top 10 reasons for adopting mLearning, demands of mobile learning, primary distinction between FLASH and HTML5 and one-stop solution for overcoming the challenges of m-learning. Raptivity supersedes all the roadblocks of mobile learning with its HTML5 publishing features. A brie overview of the enhanced features were also demonstrated during the webinar. The session was wrapped up by an interactive Q&A session where numerous queries from the audience were promptly answered by the hosts. Don’t worry if you have missed the webinar. We have recorded the webinar for you. 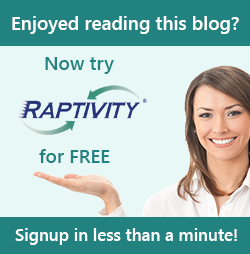 You can post your queries to info@raptivity.com .